The year 2003 marks the 25th anniversary of the Canadian Coast Guard Auxiliary. Twenty five years of service to ensure the safety of Canadian mariners and to promote safe boating practices. Twenty five years during which our volunteers saved 4200 lives, assisted 40,000 mariners facing difficulties, conducted 50,000 courtesy checks and attended 4500 boat shows. Twenty-five years working side by side with crews of the Canadian Coast Guard vessels, controllers of the Joint Rescue Coordination Centers, radio operators of the Marine Communication and Traffic Centers, SAR techs of National Defense, employees of the Office of Boating Safety and numerous other emergency service workers. Twenty-five years and countless hours devoted to the development of training material, planning of SAR exercises and fine tuning first aid skills. 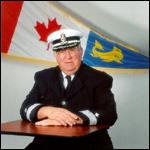 Twenty-five years during which the Canadian Coast Guard Auxiliary earned itself an enviable reputation and became a role model in the world. To all our partners, friends and supporters, thank you for your contribution over a quarter of a century. The volunteer rescuers of the CCGA have answered the calls and will continue to answer the calls of those mariners needing assistance. Happy 25th anniversary!